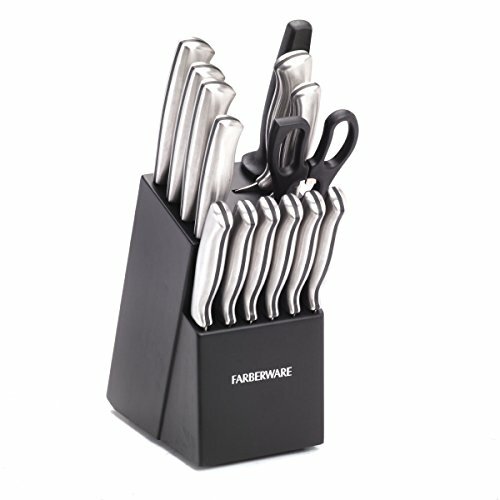 This Farberware 15 Piece Stamped Stainless Steel Cutlery Set features high-carbon stainless steel blades for strength and durability and ergonomically designed handles for comfort. The satin finish stainless steel handles are perfectly weighted for optimum balance, control and professional performance. 15 Piece Set includes an 8 inch chef knife, 8 inch bread knife, 8 inch slicer, 7 inch Santoku, 5-1/2 inch serrated utility knife, 3-1/2 inch paring knife, a pair of shears, a sharpening steel and (6) 4-1/2 inch long steak knives. All are kept attractively neat and organized in the included black block.